Sophie Bernstein is about to have her dream wedding--the perfect location, the perfect dress, and most important of all from the viewpoint of this rising young pastry chef, the perfect. And then she and her groom are going to found their dream restaurant, and tun it together. Except perfect groom Dexter has different plans, and doesn't bother to tell Sophie. While she and the guests are wondering why Dexter is late, word arrives that Dexter and a woman they've both worked with, Cookie Kelly, are in the Caribbean, where they just got married. Sophie insists on holding her head high and having the party with all that lovely food anyway, but afterwards her wedding photographer sells to the media his pictures of the unrestrained, drunken bash the party became. Overall, it's a massive, very public, humiliation. And then Sophie pisses away all the sympathy and goodwill she could have had by becoming snippy, difficult, and careless at work. But that's not the story. The story is Sophie struggling to recover from this combination of bad luck and bad jusdgment--including the fact that she spent far more on her wedding that didn't happen than she could afford, expecting that Dexter would be helping her pay it off. She's deeply in debt, and pretty much unemployable in the Chicago restaurant scene. So she moves in with her grandmother and goes to work in the local, heavy-on-tradition Jewish bakery, Langer's. It's an institution, but Herman Langer isn't keeping up with the times as the neighborhood changes. 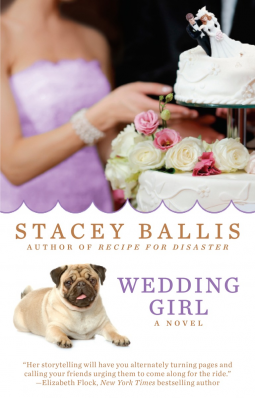 Sophie finds herself, unintentionally and against her better judgment, trying to save Langer's, and at the same time running a wedding event advice website called WeddingGirl. And what we have here is a vary nice retelling of a story that, in its previous incarnations, has been called Parfume, The Shop Around the Corner, She Loves Me, and You've Got Mail. It's an entertaining version, set in Chicago, though I'm unable to offer an informed opinion on how well it captures the Chicago feel for native Chicagoans. It also features not one but two cute little dogs. There are times when I want to give Sophie a whack upside the head, but she gets better as life goes on. Recommended for a light read. Possibly approach with caution if you're from Chicago, since I can't really judge that aspect of it.